Another brand new day. Last day went very smoothly, and the format really works well. The papers discussed yesterday and today can be found here: http://dl.acm.org/citation.cfm?id=3129790 (or open it directly with the UU proxy!). mechanism to specify and perform quality checks in the models. It proposes four views: context, functional, logical, and technical, crosscutted by data models. Their main question is consistency: how can we show that the technical view adheres to the logical view? They added the software design view, with crosscutting traceability views, that allow to express properties over different views. The traceability view takes elements from different views and connect those with arcs labeled e.g. with “realizes”, and “deploys”. Such views enable completeness checks: “Every X is realized by at least one Y”, and consistency: “Every X realizes at least one Y”. Initial evaluation has been done on two cases: cherenkov telescope array and in the automotive domain, but Sandra raises the question: “what is really new in the approach?”. As the author states, the approach started in 2014. The problem is that in the domain people have problems following the architecture approach. This framework helps them in guiding model-based architecting. This framework is the core that is extended for each domain.. However, the source code level is not (yet) added to it. One of the reasons is that most people in the domain want to use code generation. So, a next interesting question would be whether the code complies to the models. Current architecture approaches lack conceptualization and formalization. In this paper, they propose a formal approach to flexibly define a “domain-specific” architectural language capturing the concepts and rules. SROIC is a description logic that is sufficiently expressive, decidable and well supported. It also forms the basis of ontologies. One could for example make rules that are violated in event-based architectures, but allowed in component-based architectures. DL makes a difference between TBox and ABox. TBox is the predicate, ABox is an instantiation of it. (TBox: terminological, ABox: Assertional). The approach has been validated on a SOA example. The ontology is extracted from the set of rules. Next, FAMIX is used to create a source code meta model. 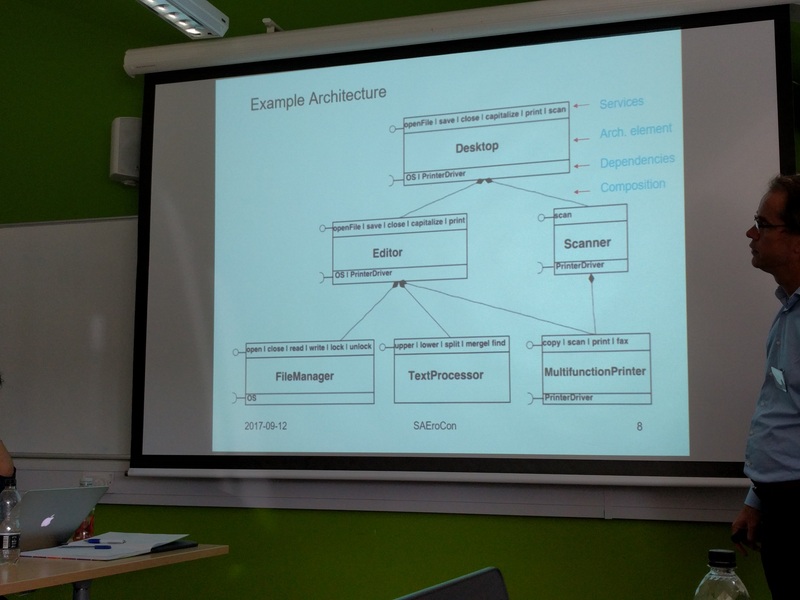 They built an ABox representation of the code based on this model, and then create a mapping to connect the architecture ontology with the source code representation, based on SWRL rules. Based on these rules, the code can be checked for consistency against the initial architectural ontology. Limitations: only a small partwas formalized, and further evaluation, e.g. on expressiveness should be studied. Some inconsistencies were not yet detected, so that also requires additional research. Another limitation pointed out by the author is to make the link between source code and architecture should be improved, e.g., by making the mapping explicit in another ontology. Important to notice: the rules can only be used to infer more knowledge (e.g. the mapping). How about consistency rules? 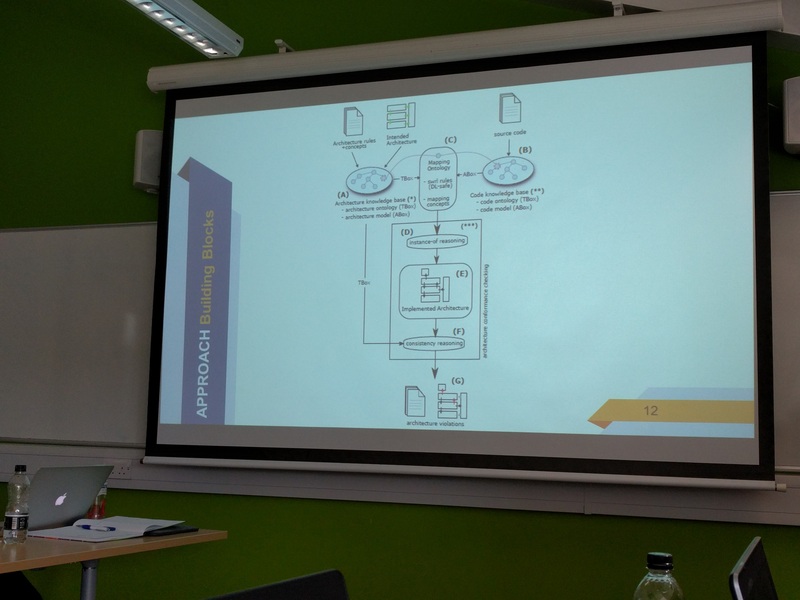 (Due to the open world assumption…), but great to link models and allow reasoning over models… Feels very much like what I did during my postdoc-time using Prolog and ontologies to define auditing rules. Correctness of software architecture is crucial for the success of the software products, and early evaluation and verification of the system help in identifying risks early on, before the system is built. That is the idea… However, many languages have been proposed, but almost none have been adopted in industry. Many are simply not intuitive enough for the software developer. There is the tradeoff between correctness and consistency which require formal methods, but hamper the developer, who tend to use informal methods (like UML). An architecture is well-formed if it is complete, self-sufficient and self-contained. Their solution is an approach based on Alloy and an existing semi-formal model: AAM (Abstract ADL Model). An architectural element is defined by services, dependencies and constraints. 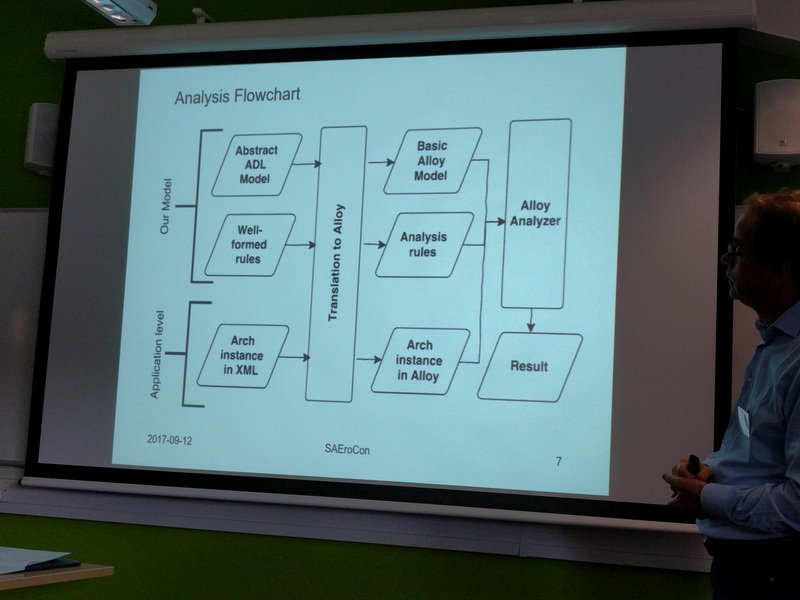 In their approach the ADL is in XML, and translated (still manually 🙁 ) into an Alloy specification, on which analysis tools can be run to validate against the given analysis rules. Why not directly use Alloy? Alloy is a full blown language, and not all details are needed for architects. Copyright © 2019 Architecture mining. Powered by WordPress. Theme: Spacious by ThemeGrill.